Charlie Company is home from Iraq. A couple thousand supporters welcomed back the western Minnesota National Guard unit last night in Morris. There was praise for the troops mixed with sorrow, because three of the company's soldiers were killed during its stay in Baghdad. Morris, Minn. — It was time to rejoice and reflect as about 150 soldiers returned to the towns they call home -- Morris, Montevideo, Appleton, Madison, Ortonville and others. Company Commander Troy Fink of Minneota says the troops were surprised by the size of the welcome. He says they got their first taste Sunday night as they rode buses from the Twin Cities to Morris. "They were in awe on how many people were actually out in the bitter cold, sitting out there waving," said Fink. "All the American flags and the little Charlie Company 'hero hankies.' The guys were excited to be here, and very proud of the fact that all these people were out for them." A large crowd also gathered for the formal homecoming at the University of Minnesota, Morris. "Ladies and gentlemen, please remain standing and welcome home the soldiers of Charlie Company, 1st Battalion, 151st Field Artillery," declared the master of ceremonies. Many of the soldiers broke into smiles as they marched into the gym, clearly moved by the tribute. The unit went to Iraq in October 2004. They left Iraq 11 days ago. Minnesota Gov. Tim Pawlenty told the crowd if they want role models, there were 150 of them seated in front of him. "Our country spends way too much time honoring, and thinking about, and talking about people like rock stars and movie stars and singers and the like," said Pawlenty. "Those folks are entertaining, but they are not our role models. The folks who should be our role models, who personify the great values of this country, are these folks right here." Charlie Company suffered the single most tragic day of any Minnesota unit to serve in Iraq. On Feb. 21, 2005, a roadside bomb killed three members of the unit -- Jason Timmerman, David Day and Jesse Lhotka. Charlie Company Commander Captain Troy Fink says the three had gone to help some fellow Guard soldiers who were hurt when their vehicle overturned. "It's one those things that hurts," says Fink. "It's one of those things that makes you wonder if you're always making the right decisions. They will live forever in my mind and in my heart. They're my friends." The joyous welcome-back celebration at a warm university gym came a couple hours after a more solemn observance outside in the winter cold. "Every Memorial Day I ask that each and everyone of you take moments of time and reflect. 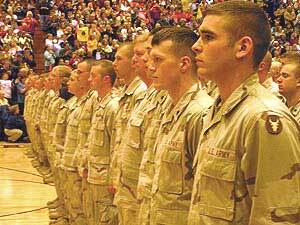 Because etched in our minds is Timmerman, Lhotka and Day," said the head of the Minnesota National Guard, Adj. Gen. Larry Shellito. Shellito helped dedicate a memorial to the three outside the National Guard Armory in Morris. Etched in black stone are the faces of the soldiers. Jesse Lhotka's wife, Stacy, was one of the family members at the ceremony. "Our family's very happy that my husband's brothers are home," says Lhotka. "But it's also a very bittersweet day because our husbands should be here as well." The immediate task for the soldiers of Charlie Company is to readjust to civilian life. Sgt. 1st Class Chris Dunsmore of Sacred Heart says he'll look for a job in agriculture. "I'm going to sit back, enjoy the holiday season, relax, cool down a little bit," says Dunsmore. "Then after the first of the year, I'll explore my different avenues and which direction my life's going to take from here on out." There will be tough days ahead for some of these soldiers as they look for jobs, and make other adjustments to civilian life. The government has all sorts of programs ready, lessons to help them make the change. Some are better than others. It's possible one of the best came at a university gym. It was a short course on the positive effects of appreciation, taught by a faculty of thousands in a western Minnesota college town.